Replacing joints faster, cheaper and better? Before Stacey Cook received the first of two hip replacements last year at an outpatient surgery center in Davenport, Iowa, his surgeon, Dr. John Hoffman, told him he would be standing and walking within a few hours and would go home the next morning. After each surgery, he went home the next morning, receiving assistance from family and friends for the first week. A year later, he's walking the golf course and even shooting basketball. Cook's experience with Hoffman and the Mississippi Valley Surgery Center differed sharply from that of most U.S. patients who receive total hip or knee replacements, known as arthroplasties. They typically are operated on in an inpatient surgical unit, spend several days in a hospital bed, then move to a skilled-nursing or rehabilitation facility or receive home healthcare. But that's starting to change, and tensions are rising between hospitals and orthopedic surgeons as a result. Building on advances in surgical technique, anesthesia and pain control, a small but growing number of surgeons around the country are moving more of their total joint replacement procedures out of the hospital, performing these lucrative operations in outpatient facilities. Some are sending their patients home within a few hours, while others have their patients recover overnight in the surgery center or hospital during 23-hour stays. These surgeons say very few of their patients require skilled nursing, rehab or home healthcare. The Ambulatory Surgery Center Association says close to 40 centers around the country are performing outpatient joint replacements, and outpatient surgery companies such as Surgical Care Affiliates are aiming to increase them. Moving these procedures to outpatient settings poses a major threat to hospital finances, since total joint replacements are one of the largest and most profitable service lines at many hospitals. 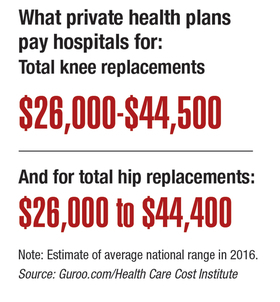 In 2014, more than 400,000 Medicare beneficiaries received a hip or knee replacement, costing the government more than $7 billion for the hospitalizations alone—over $50,000 per case. The financial threat will be even greater if the CMS changes its rules and allows Medicare and Medicaid payment for these outpatient procedures, which observers expect will happen in the next few years. The migration of total joint replacements to outpatient settings also raises questions about the future of Medicare's mandatory bundled-payment initiative for inpatient procedures in 67 markets around the country, called the Comprehensive Care for Joint Replacement program, which began in April. If the CMS decides to pay for ambulatory procedures, that could undercut the hospital bundling initiative. The migration of lucrative joint-replacement surgeries to outpatient settings will cause friction between surgeons and hospitals and raises questions about the premise of Medicare's new bundled-payment initiative for hospital-based procedures. Critics ask, so what? “Why would we not encourage the migration to outpatient if the outcome is the same and the cost is lower?” said Jeff Goldsmith, a national adviser to Navigant Healthcare. Goldsmith, a Medicare beneficiary, recently underwent a hip replacement and recovered so quickly he thinks it could have been done on an outpatient basis. “Why preserve the (inpatient bundling) program if the whole point is to save money for Medicare?” he said. Until recently, outpatient total joint replacements were rare. Most providers and patients thought a several-day hospital stay was needed because of the pain, mobility and infection risks associated with these major surgeries. Now, when patients' health plans allow it, leading surgeons in this field say they are doing many or most of their joint replacements on an outpatient basis—except for patients who are extremely obese or have unstable chronic conditions. They say even healthy patients in their 70s or 80s can be candidates for outpatient surgery, but careful patient selection is essential. Despite the looming financial threat, many hospitals have not settled on a strategy to address the outpatient migration, particularly where local surgeons have not yet adopted this new practice pattern. In some markets, hospitals and surgeons are starting to collaborate, while in others there may be conflict over who will capture the big dollars from joint replacements, which are surging as the baby boomers move into their creakier years. “This is coming whether we like it or not, and we have to figure out how to better partner with physician practices to deliver the best care for patients and hopefully protect patient volume for the hospital,” said Kyle Armstrong, CEO of Baptist Memorial Hospital-Collierville, a suburb of Memphis served by Toy's free-standing surgery center. “I can imagine there will be some areas where it is contentious.” His system has considered buying or partnering in a Memphis outpatient surgery center. In 2014, 23% of 354 hospitals analyzed by the Advisory Board Co. performed at least some outpatient knee replacements, while 7% performed at least some outpatient hip replacements. Experts say those numbers likely have increased in the past two years as more surgeons and their teams gain confidence with new and improved clinical protocols, making it possible to release patients more quickly. Even at hospitals that are already collaborating with their surgeons on outpatient joint replacements, executives caution that there are problems making outpatient joint replacements financially viable. “The current ambulatory reimbursement system isn't really sufficient to cover the overall cost of care,” said Michael Dandorph, chief operating officer at Rush University Medical Center in Chicago. He projects that up to 25% of joint replacements may be done on an outpatient basis within five years if Medicare starts paying for them. “On a single-case basis, we're taking a revenue hit. But if it produces better outcomes and lowers the cost, that should attract more patients,” he said. 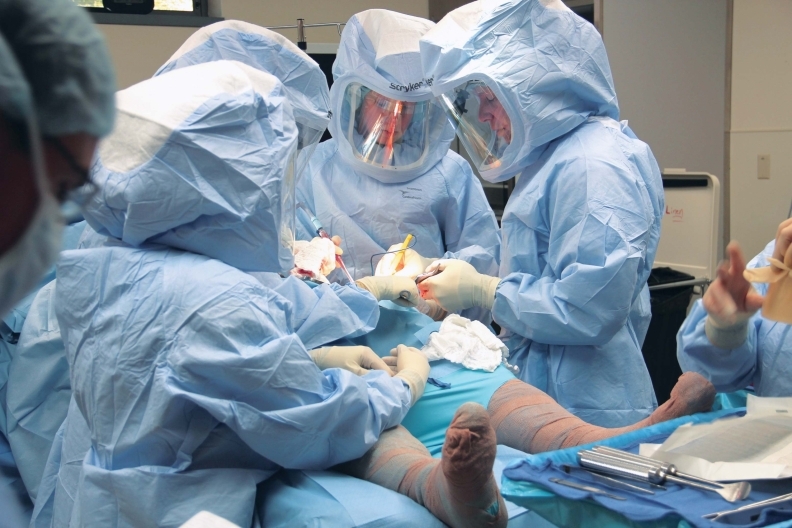 Orthopedic surgeons say that while they would like to collaborate with hospitals on outpatient joint replacements, institutional inertia makes it hard to implement innovative practices that better serve patients. 23-hour joint replacement procedures either in hospital-run surgical units or outpatient centers, depending on each patient's needs. Dr. Joseph Nessler and his colleagues at St. Cloud Orthopedics, a 21-physician independent practice group, are doing more than 300 total joint replacements a year on an outpatient basis, divided between the physician-owned St. Cloud Surgical Center and the hospital. The chosen surgical setting is based on each patient's medical condition and whether an overnight stay is needed. St. Cloud Hospital staff have honed their clinical processes to reduce the percentage of patients who need blood transfusions from 25% to zero, get patients up and moving within hours after surgery, and ensure they see a physical therapist that same day, said Naomi Schneider, the hospital's orthopedics director. They have also launched an intensive pre-surgical education program for patients, using videos and online resources, so they are ready for the rapid return home. Even though about 25% of the total joint replacements Nessler and his colleagues performed last year were at their free-standing surgery center, the hospital still saw nearly a 10% jump in volume for joint replacements, Schneider said. That's because the combined program is drawing patients from all over the region who want a high-quality, in-and-out experience. Currently, there are no other providers in the area offering a well-established outpatient joint replacement program. Other hospital systems, such as UnityPoint Health in Iowa and Illinois, are buying an ownership interest in outpatient surgery centers where orthopedists are performing same-day joint replacement procedures. Last year, UnityPoint acquired an interest in the Mississippi Valley Surgery Center; Hoffman and his colleagues performed more than 200 total joint replacements there in 2015. The other new partner in Hoffman's surgery center is Surgical Care Affiliates, a publicly traded operator of ambulatory surgery clinics across the country. The company, which just announced an investment in a clinical platform to expand its network of surgeons performing outpatient joint replacements, says it now has 18 centers doing these procedures. A major factor delaying the migration of joint replacements out of the hospital setting, however, is that the CMS has limited Medicare and Medicaid payments to inpatient procedures only. It withdrew its 2012 proposed rule to allow payment for outpatient total knee replacements in the face of negative industry comments. The American Hospital Association opposed the rule change, arguing that outpatient joint replacements hadn't been proven safe. An AHA spokeswoman says the association has not reconsidered its position. Nevertheless, many experts say the outpatient procedures are now considered safe if done by well-prepared surgical teams on properly selected patients. Some orthopedic surgeons and the Ambulatory Surgery Center Association have lobbied the CMS to change its payment rule, which would greatly increase the number of potential patients for outpatient joint replacements since the majority of people who need hip and knee implants are age 65 or older. A CMS spokesman would not say whether the agency is considering lobbyists' request. Private payers also are sometimes balky about paying for outpatient joint replacements, surgeons and administrators say. Some orthopedic groups, such as the Orthopedic & Sports Institute of the Fox Valley in Appleton, Wis., and Monterey (Calif.) Peninsula Surgery Center, have signed bundled-payment contracts with insurers for outpatient joint replacements, according to the Ambulatory Surgery Center Association. Blue Shield of California is one insurer paying for these outpatient procedures under a bundled-fee arrangement. But experts expect payers to embrace the trend as more patients opt for having these procedures done in the cheaper outpatient setting, reducing their out-of-pocket costs under high-deductible health plans.